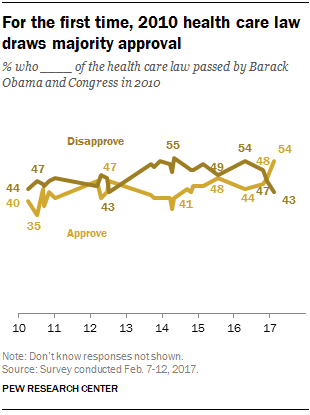 With congressional Republicans discussing proposals to replace the Affordable Care Act, public support for the 2010 health care law has reached its highest level on record. Currently, 54% approve of the health care law passed seven years ago by Barack Obama and Congress, while 43% disapprove, according to a national Pew Research Center survey conducted Feb. 7-12 among 1,503 adults. Throughout the law’s history, opinions about the Affordable Care Act have tended to be more negative than positive — or, less frequently, divided. As recently as December, about as many approved (48%) as disapproved (47%) of the law. The new survey finds that when those who disapprove of the law are asked about what should happen to it now, more want GOP congressional leaders to focus their efforts on modifying the law than on getting rid of it. One-in-four adults want Republican leaders to modify the law, while 17% want them to get rid of it entirely. As in the past, there are deep partisan divisions over the health care law. Democrats overwhelmingly support the law, with 85% expressing approval. Among independents, about half (53%) approve of the health care law, while 45% disapprove. By contrast, Republicans broadly disapprove of the law (89%); just 10% express approval. Among independents, nearly twice as many say Republican leaders should focus on modifying the law rather than scrapping it (29% vs. 15%). Independents have grown in their support of the health care law in the past year. As was the case in December, about half (53%) now approve of the Affordable Care Act. In October, shortly before the election, 41% of independents approved of the law. About three-quarters of Democratic-leaning independents (78%) support the health care law, little changed from December, but up 14 percentage points since October (from 64%). 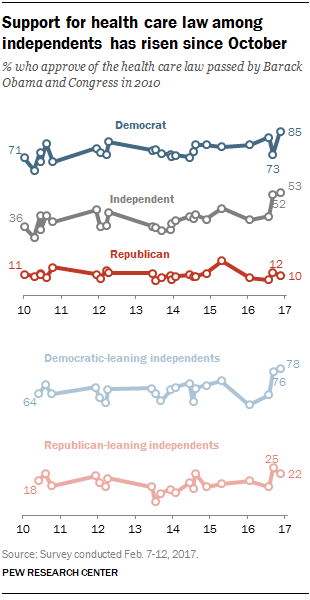 Opinions of Republican-leaning independents have shown less change; currently, 22% favor the law. Democratic support for the law, which dipped in December, has increased 12 points since then (from 73% to 85%). There has been little recent change in Republicans’ views of the health care law. Younger adults are more likely than older people to approve of the health care law. Today, by about two-to-one, those younger than 30 approve (65% approve vs. 31% disapprove). In October, opinion among young people was more evenly divided (51% approve vs. 45% disapprove). Since then, support also has increased among those ages 50 to 64 (52% now, 40% then). 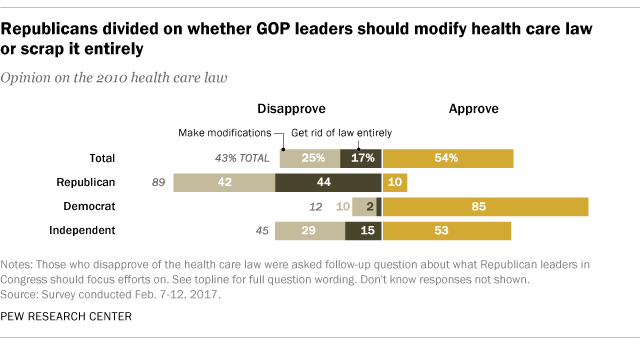 Postgraduates continue to express broad approval of the health care law: About two-thirds (68%) approve today, which is little changed from October. Among college graduates, a majority today expresses approval of the law (58%) – on par with the share who approved in December (56%), but up 10 points from before the election. In October, college graduates were divided; as many approved as disapproved (48% each). Among whites, the educational divide is even wider. A 64% majority of white postgraduates approve of the law, equal to the share that expressed approval in October. White college graduates today have ticked up in their support for the health care law: About half (52%) currently approve, compared with 41% in October. But among whites with some college experience or less education, a majority (62%) disapproves of the Affordable Care Act, compared with just about a third who approve (36%). In October, 30% approved of the law. Note: Survey methodology can be found here, and topline can be found here (PDF).